We know pets typically do not like going to the vet, especially if they have to be put under for a simple teeth cleaning. Putting animals under is a very delicate procedure and can even be life threatening. 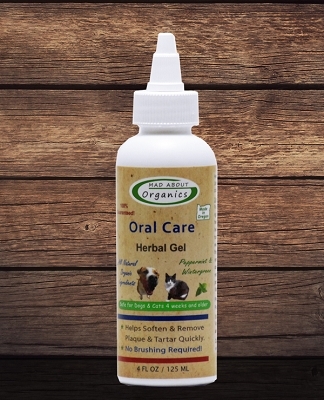 This is one reason why we developed this wonderful Organic Herbal Gel Oral Treatment, to help keep your animals' teeth and gums healthy. Healthy teeth and gums are very important for your pets. 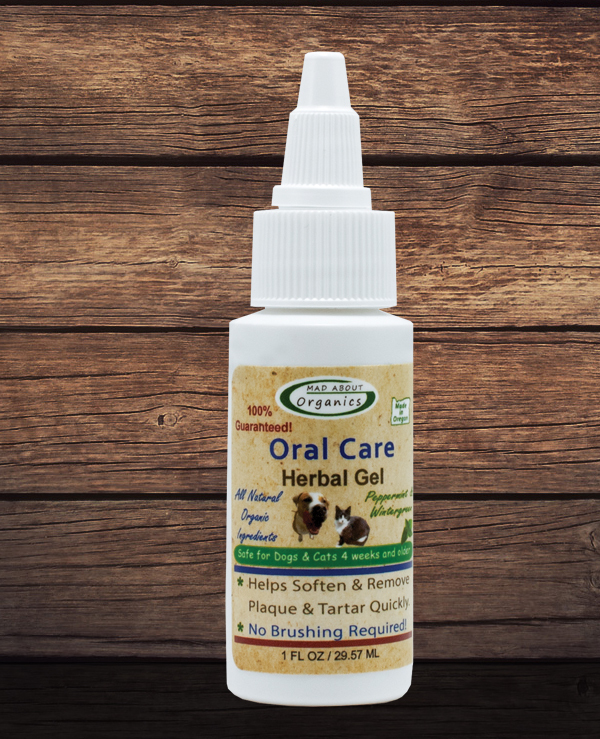 With the use of our Organic Herbal Gel Oral Treatment you will save an expensive trip to the vet and possibly your pet's life! Mad About Organics' Organic Herbal Gel Oral Treatment is made in the USA - based in Eugene, Oregon and packaged in a recyclable plastic bottle. 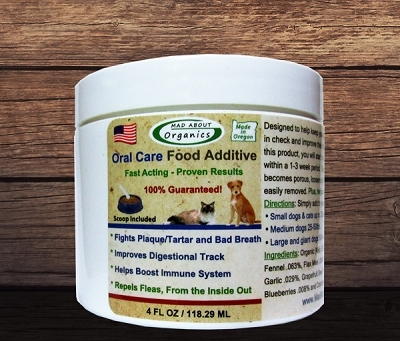 I have just started using this product my 4 year old poodle/mix chipped a molar on a pig hoof that he stole from the puppy so I have been applying it to that tooth to keep it extra clean. So far so good. 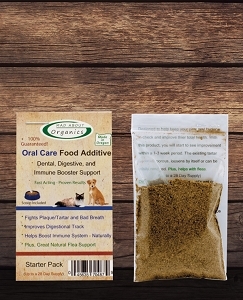 Excellent line of flea and tick products. My vet is going to lose hundreds of dollars a year because I am no longer buying their products that poison my pets!! Apply with your finger or with a soft "finger brush" style toothbrush. You may notice your pet licking their lips repeatedly. This helps mix the gel with your pet’s saliva, and the natural ingredients will coat all surfaces of your pet’s teeth and gums. Allow no food or water for 1/2 hour before and after application. Brushing every 1-3 days enhances results. 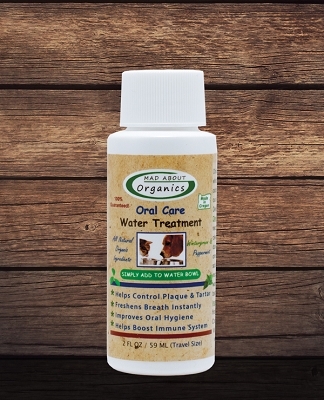 If you have a pet with heavy plaque and tarter build-up, apply first thing in the morning and again in the evening. You should start noticing positive changes after just one week. If applying with a brush, a "soft" or finger brush is recommended. The brushing action removes the plaque and tartar that has been softened by the ingredients in the gel. After 30 days when most or all of the build-up has been removed, you can reduce to one application every 2nd or 3rd day. Your pet’s plaque and tartar should not return with this recommended usage. It is not necessary to brush, but occasional brushing may improve results. 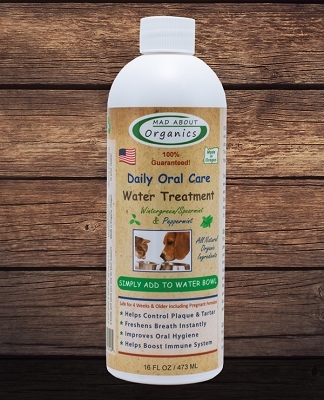 For your pet(s) total dental protection and health, we also recommend the use of Mad About Organics' Oral Care Food Additive and Oral Care Water Treatment, which is simply added to their water dish each time you refill.